Enter for a chance to win 49ers tickets, autographed gear and more! 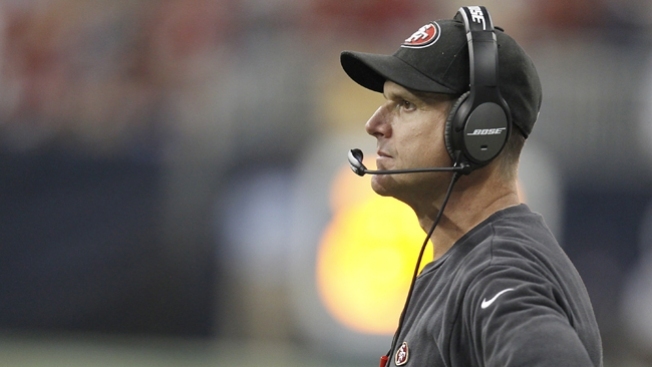 Jim Harbaugh has a job with the 49ers and Michigan has a coach. For now, anyway. Once a Wolverine, always a Wolverine? While his unique style has made the San Francisco 49ers one of the NFL's top teams over the past two seasons, head coach Jim Harbaugh has yet to deliver Super Bowl glory to the Bay Area. And with one season left on his contract, he is being linked ever more strongly with an exit, with or without a trophy -- this time, to his alma mater Michigan, according to reports. Could Harbaugh really exit the professional coaching ranks and return to college, where he made Stanford a powerhouse before moving up the Peninsula -- and then back down again -- to run the 49ers? The current Michigan coach, Brady Hoke, is a "dead man walking" after a brutal recent loss. And Harbaugh has come close to walking off the job before, very nearly moving to the Cleveland Browns earlier this year. What's more, all is not well in 49erland, the Web site notes: Harbaugh has had an uneasy, erratic relationship with general manager Trent Baalke. Plus, there have been injuries, suspensions, and an "average" Colin Kaepernick...all that means that there is less than usual to keep Harbaugh around. Except the Super Bowl. If Harbaugh is anything, he is competitive, and the chance at hoisting the trophy that Seahawks coach Pete Carroll got his hands on in January could be too much to resist.